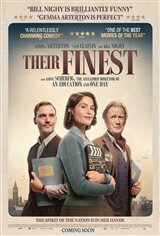 A group of filmmakers — Catrin Cole (Gemma Arterton), Tom Buckley (Sam Claflin) and Ambrose Hilliard (Bill Nighy) — attempt to boost morale during World War ll. They do this by struggling to make an inspirational propaganda film about the successful battle at Dunkirk to inspire the people of Britain, and get them to continue the war effort during the London Blitz. In producing the film, the characters learn that everyone has a role to play in defeating the Nazis and that perseverance is key – from that, bonds are made that the horrors of war cannot break.